EASTERN Province permanent secretary Chanda Kasolo has ordered Patriotic Front cadres who have encroached on land belonging to Zambia Railways Limited (ZRL) to move out or risk being arrested and charged with criminal trespass. 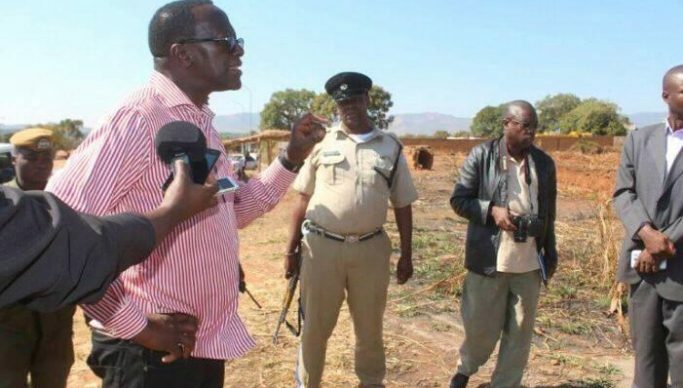 Speaking when he toured the site where PF cadres are constructing and allocating plots to unsuspecting individuals, Kasolo who was accompanied by officers from ZRL and police in riot gear said it was very clear that the encroachers had been directed to the area. Kasolo said he would take appropriate action against any councillor involved in the illegal allocation of plots on the ZRL land. “If they are proved that there are councillors involved, I will take appropriate action against that councillor. It’s about time councillors were proud of their government and their party. You know this shows bad light against the PF because you know everybody is writing, saying ‘the PF cadres have taken over the land’ and so on and so forth. So that’s why I came here first thing and I got the police to do their job and put a stop to this. I will not allow illegality to be legalized here,” he said. Kasolo also dismissed an assertion by one of the encroachers who was found building on the land in question that they were given a go-ahead by provincial minister Makebi Zulu. “They (encroachers) lie and lie a lot. As you can tell they are trying to implicate my provincial minister. It’s a total lie. My minister is a lawyer and he knows more than I do that any illegal act cannot be formalized as legal – it is always illegal,” he said. Meanwhile, Chipata mayor Sinoya Mwale says the council did not allocate plots to anyone on Zambia Railways Limited land.